After months of stress in ties, India and Nepal on Saturday agreed to crank-up cooperation in connectivity, trade, agriculture and border security as Prime Minister Narendra Modi gave an assurance that New Delhi remains committed to strengthening the partnership as per Nepal's priorities.Seeking to readjust the ties, Nepal Prime Minister K.P. Sharma Oli, on a three-day visit to India, held wide-ranging talks with Modi, who also assured the visiting leader that India would always back Nepal in its quest for development.A joint statement issued after the talks said Prime Minister Oli stated that his government attaches high importance to further strengthening friendly relations with India. He expressed the desire of the Government of Nepal to develop bilateral relations in a way so as to benefit from India's progress and prosperity for economic transformation and development. 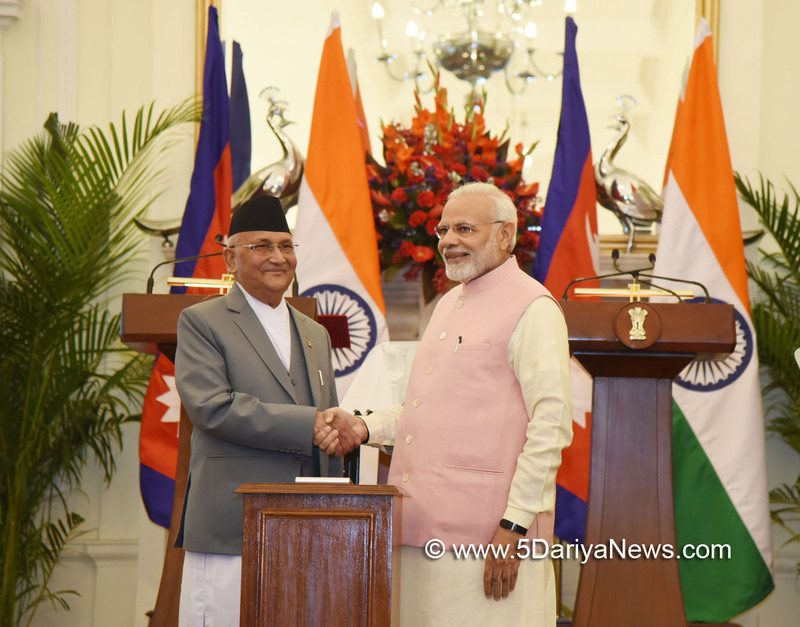 "Prime Minister Modi assured Prime Minister Oli that India remains committed to strengthening its partnership with Nepal as per the priorities of the Government of Nepal," the statement said.Oli, who has developed closer ties with China with a known pro-Beijing stance, said he has come to India "with a mission" to take bilateral ties based on "principles of equality and justice" to newer heights but "commensurate with the realities of the 21st Century".In a joint address to the media with Oli, Modi hailed the Nepal Prime Minister's "vision for a prosperous Nepal" that is in sync with his vision of "sabka sath, sabka vikas" (development for all)." India stands ready to expand cooperation with Nepal as per Nepal's priorities. We believe that enhanced connectivity between our countries will boost our economic growth and benefit our citizens. "Modi hailed successful conduct of polls in Nepal and congratulated both the people of Nepal and the government for entering into "a new era of political history".He said the two countries agreed to put on faster tracks all connectivity projects, announcing that a new railway line will be built "with India's financial support" to connect the border city of Raxaul in India to Kathmandu in Nepal.The objective, according to a joint statement, is to expand "connectivity" between the two neighbours and "enhance people-to-people linkages and promote economic growth and development".Prime Ministers Modi and Oli also recognised the untapped potential of inland waterways between the countries that can contribute in an overall economic development of the Himalayan region.Towards that, the statement said, they took a "landmark decision" to develop the inland waterways for the movement of cargo, within the framework of trade and transit arrangements, providing additional access to sea for Nepal. This will enable cost effective and efficient movement of cargo and greatly impact the growth of business and economy of Nepal.The connectivity proposals are significant and come nearly two years after China in March 2016 agreed to construct a strategic railway link with Nepal through Tibet to reduce the Kathmandu's total dependence on India.That year China also signed a transit trade treaty with Nepal that completely depends on Indian sea ports for third-country trade. Apart from this, China is also building three highways connecting Nepal and these roads are expected to be ready by 2020.The Nepal-China agreements came at a time when Kathmandu-New Delhi ties started soaring after a border blockade in 2015-16. Many in Kathmandu blamed India for the 135-day blockade from September, 2015 to February, 2016 that crippled Nepal's economy.China expanding its strategic base in Nepal sparked concerns in India that it was losing its foothold in its immediate backyard despite its "neighbourhood first" policy.But Oli's April 6-8 visit indicated a new India-Nepal bonhomie during which he and Modi announced enhanced security ties, particularly on borders to curb curb misuse of open boundaries between the two countries. "We have strong relations when it comes to the aspect of security and are committed towards stopping misuse of our open borders," said Modi, with Oli by his side.Oli said his government accorded a priority to friends like India that has helped his landlocked nation in fighting poverty. "Friendship is very important. We have developed our friendship according to time with a purpose to eradicate poverty, improve life standards. Our friendship is historical, renewed, developed and is very fruitful. Looking ahead and not looking back"He said his country always accorded "great importance" to its ties with India as the two neighbours have many "things to offer each other". "Inter-dependence takes many forms between our countries. Relations between neighbours are different than others. They rest on principles of equality and justice. "I have come to India with a mission to enhance our relations to newer heights commensurate with the realities of the 21st Century. We want to create a model relationship. A relationship that is cherished forever," he said, renewing his invitation to Modi to pay a visit to Nepal at the earliest.Boosting their ties further, India also agreed to conduct a pilot project on organic farming and soil health monitoring in Nepal to help the natural resource-rich neighbour in developing agriculture and allied sectors.Oli and his wife Radika Shakya, who arrived here on Friday, earlier paid tributes to Mahatma Gandhi at Rajghat, before driving to the President's house for a ceremonial welcome.Viewed as an important visit, Oli has flew in a 54-member high-level delegation to India, seeking more investment from India's public as well as private sector.This is Oli's first foriegn trip after returning to power for the second term in February.